Telegram app opens in default browser instead of in its own window. When I launch Telegram it opens its own window that turns white/gray/blank and then launches the Telegram interface in my default browser Firefox. If Firefox isn't running it will launch Firefox. I am running Ubuntu 14.04 64bit. Hi Christer! In Ubuntu 14.10 the default webapp browser is not Firefox, I'm thinking you have a system setting changed. As I said if you READ i am running 14.04 NOT 14.10. I have the same issue on Ubuntu 14.04 LTS 32bit. I have attached the screen grab of the bug. Same here. 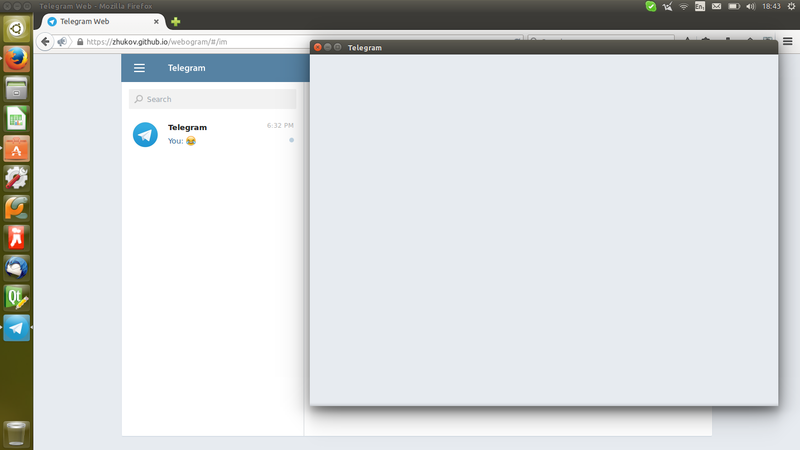 The program opens the browser and then you can use telegram from it. Hi! :) Could you update the app and try it again? Thanks in advance! Great! Thanks for your feedbacks!! !